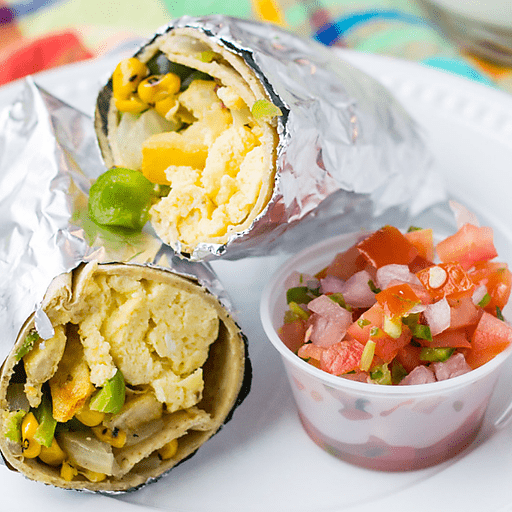 Stuffed with peppers, corn, eggs and cheese, our Southwest Breakfast Burritos are a great way to start the day! The best part – these filling burritos can be made ahead of time and frozen for future breakfasts. Just remove foil from frozen burritos and microwave for 60-90 seconds until warm. 1. Place bacon on plate sandwiched between paper towels and microwave for 1-2 minutes or until desired crispness achieved (cooking time will depend on thickness of bacon). After cool to touch, crumble and set aside. 1. Heat 2 tsp. olive oil in a large skillet over medium high heat. Once hot, add onion, pepper and corn. Sauté 5 minutes or until softened. Season with salt and pepper. Remove veggie mixture from pan and set aside. 1. In a bowl, whisk together eggs and cheese. In now empty pan, add remaining 1 tsp. olive oil. Add eggs and scramble until done. Turn off heat and set aside. 1. Microwave one tortilla at a time for 30 seconds to soften. In the center of the softened tortilla, layer scrambled eggs, veggie mixture, French fries and avocado. Tightly roll up tortilla and repeat with remaining ingredients. Serve with salsa or roll finished burritos in aluminum foil to help keep them packed tight and freeze. To thaw frozen burritos, remove the foil and cook in microwave for 60-90 seconds. Calories 500, Total Fat 30g (Saturated 11g, Trans 0g), Cholesterol 140mg, Sodium 630mg, Total Carbohydrate 38g (Dietary Fiber 8g, Sugars 2g), Protein 21g, Vitamin A 15%, Vitamin C 50% Calcium 35%, Iron 15% *Nutritional values are an approximation. Actual nutritional values may vary due to preparation techniques, variations related to suppliers, regional and seasonal differences, or rounding.